It’s Valentine’s Day next Monday! 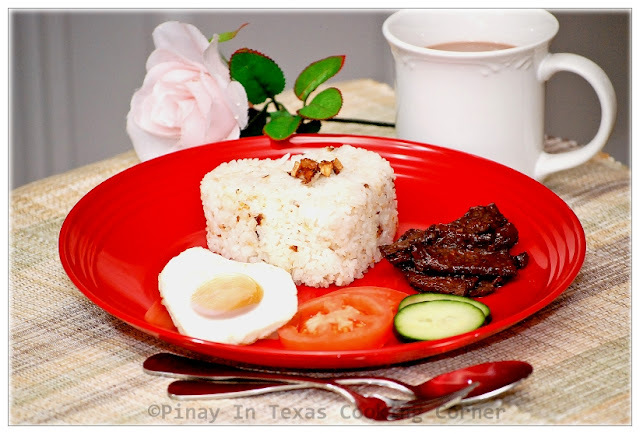 For this week, Pinay In Texas Cooking Corner will be featuring Pinoy recipes that you can prepare for your family on Valentine’s Day, i.e., for breakfast, lunch, merienda(snack) and dinner. There will be dessert recipes too! 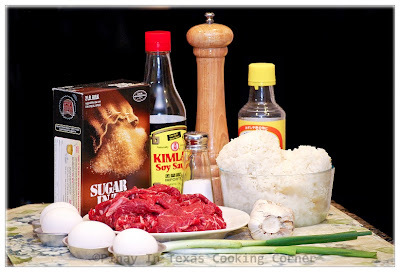 First recipe is Tapsilog which you can serve for breakfast on Valentine’s Day. Here’s my hearty Tapsilog recipe for breakfast that will get your family off to a good start on Valentine’s Day! 4. Make garlic fried rice in the same pan . Saute the garlic until golden brown. Add the rice. Break it down and mix it well, so the oil gets on all of the rice. Add salt to suit your taste. Fill a heart-shaped cup (or any cup if you don't have heart shaped ones) with rice. Put cup upside down on the plate beside the beef strips then lift. Garnish rice with fried garlic on top. 5. Serve with sunny-side up or scrambled egg. This is meant for Valentine’s Day breakfast so I made heart shaped sunny-side-up eggs. I used a heart shaped egg ring to shape the egg while being fried. If you don’t have one, you can just carefully trim the sides of the egg using a knife after frying (just do this if you want heart-shaped eggs). 6. Serve with hot coffee or hot chocolate! * You can also serve it with slices of cucumber and/or tomatoes.